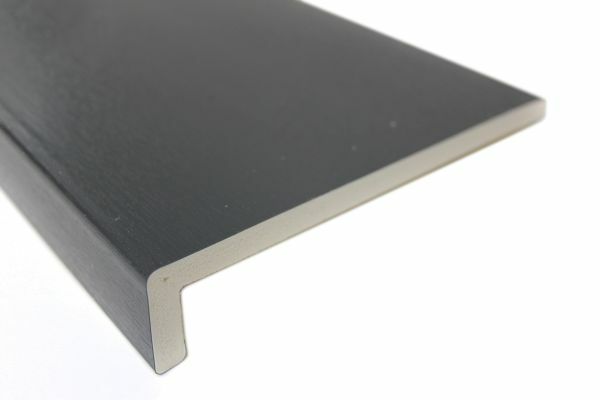 The complete range of anthracite grey woodgrain fascia and soffit boards manufactured from high density upvc and produced by Deeplas. All products in this range carry the BBA accreditation and are fully kite marked. Which Type of Fascia to Choose ? The majority of tradesmen in the roofline industry tend to choose the 9mm capping fascia boards with the intention of fitting them over pre-existing timber fascias to provide a quick installation. It should be noted that if this is done the existing timber fascias really need to be sound and rot free. Unfortunately though, even if this is the case most standard timber fascias are simply made from untreated softwood with just a few coats of paint for protection. Accordingly, problems can occur if moisture becomes trapped between the timber and the upvc fascia. In this instance, it is very possible that wet rot will manifest after a few years causing the new fascias/gutters to detach from the old fascia and in the worst case scenario, literally fall down. So in a nutshell it is always best practice to remove all existing timber fascias and indeed soffits prior to installation of upvc. Fitting a 9mm capping fascia will take longer than fitting the 16mm fascia because you will need to fit a treated backing timber first which is much the same as fitting an actual fascia in itself. The 'pressure treated' backing timber is 20mm thick and will be used to take the weight of the eave tiles along the perimeter of the roof. Once this is done it is a relatively easy job to cap over the timber with the new 9mm capping fascia and the beauty of this is that you only need to use the smaller 30mm or 40mm polypins which have small plastic heads, these will be far less noticeable than the bigger polynails that have to be used with the 16mm full replacement boards. The resulting installation provides an overall thickness of just under 30mm and so when the guttering is fitted not only will the screws be fitted into plastic but also into the tanalised timber which in our opinion provides for the strongest roofline installation. The 16mm boards are designed for fitting directly onto the existing rafter feet without the need for backing timber. These boards will need to be fitted with the larger 50mm or 65mm polynails and directly fixed through into the rafter feet. Obviously this system is a lot quicker because it is just one operation and it is mainly adopted on new developments and construction projects. The subsequent gutter fittings will be reliant only on the thickness of the board unless of course you plan to screw through the fascia and into the rafter as well which may be possible in some areas but not all. Nevertheless, this system is still widely accepted as sufficient for most new builds.